The objective of the game is to guess or predict correctly whether the next card will have a higher or lower value than the current one. The player automatically loses if the next card and the current card is tie or if it has the same value. Over a long period of time, the game is likely to average a return to the player of 98.36% of the total bets made. Note: Potential wins above the maximum payout per bet allowed will be capped and this will adversely affect your %RTP. The amount will depend on your currency and stake selection. To start playing, the player may select their desired stake. 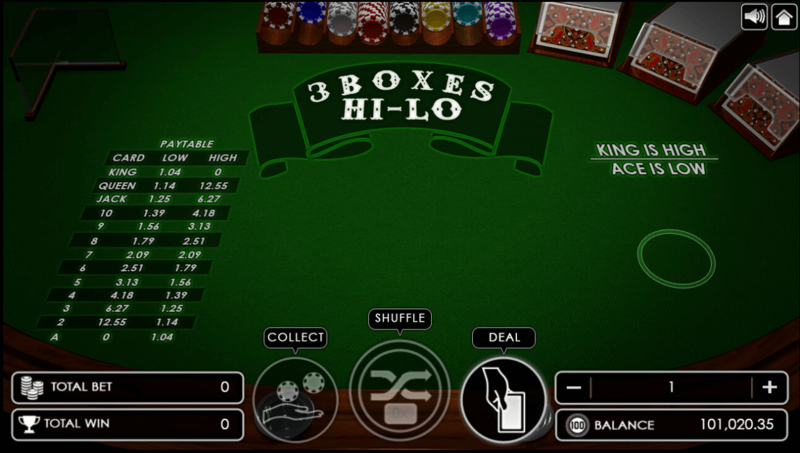 After selecting his desired stake, the player may now click on DEAL button to start the round. Upon clicking the DEAL button, three cards will be distributed to the left, middle, and right respectively. 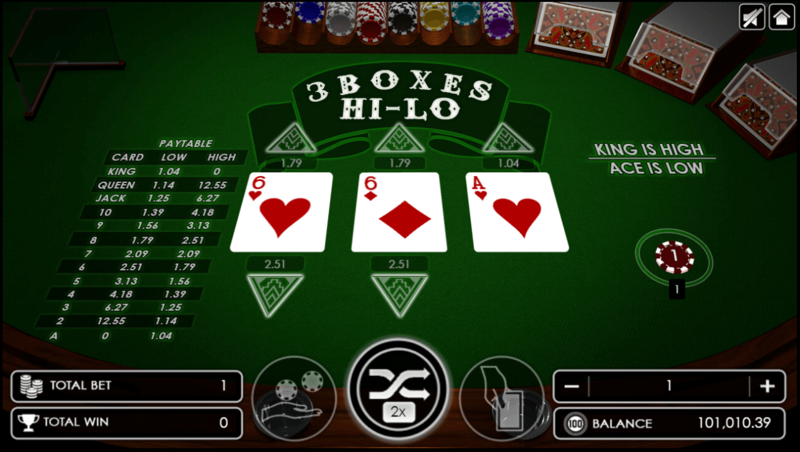 The player may choose which one out of the three boxes to have higher or lower value for the next distribution. 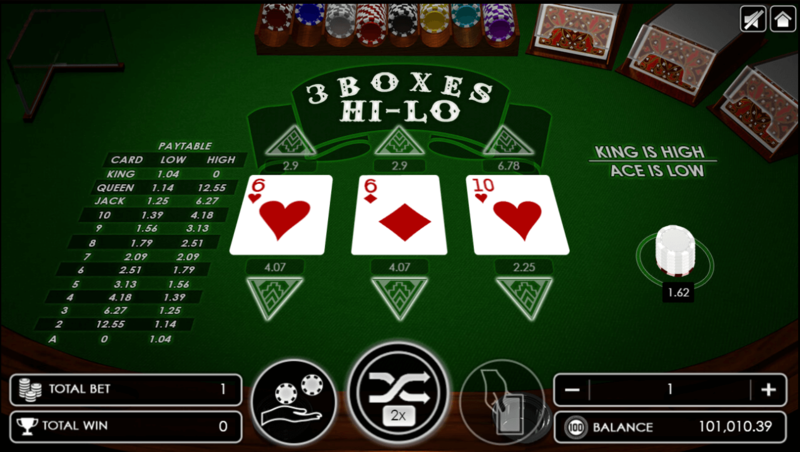 On the example above the player is about to click “Hi” button on the 3rd box (Ace of Heart), which have a higher chance of winning. After clicking on HIGHER button, a new card will be distributed to compare whether the card is HIGHER or LOWER. In this case; (Five of Spades) is dealt and it has the higher value than (Ace of Heart), so the player will win the bet accordingly to the paytable. 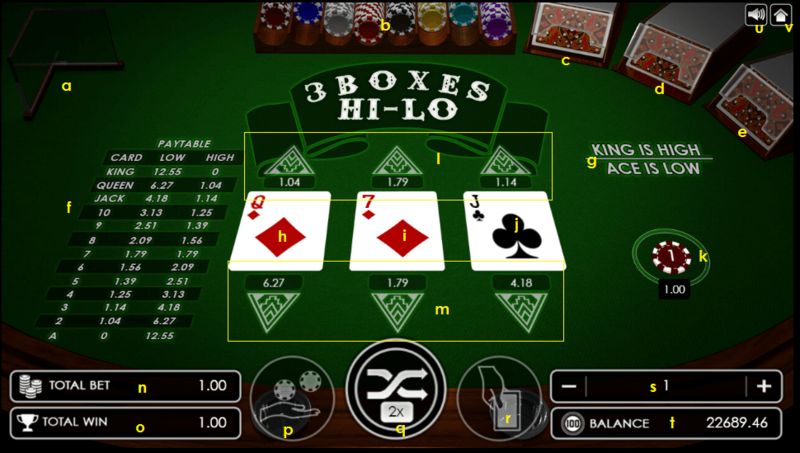 Another example of the game is the image above where the player chooses Hi at 3rd box. The player does not have to specifically choose the same box for their next prediction. 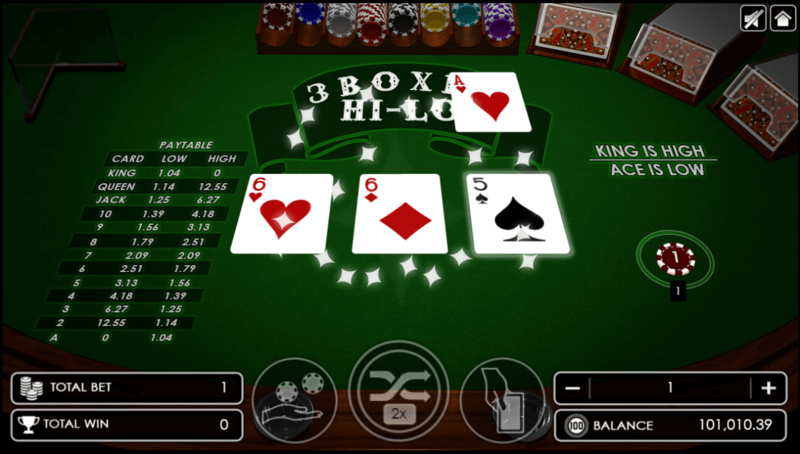 The player has an option to continue to play or collect his winnings. 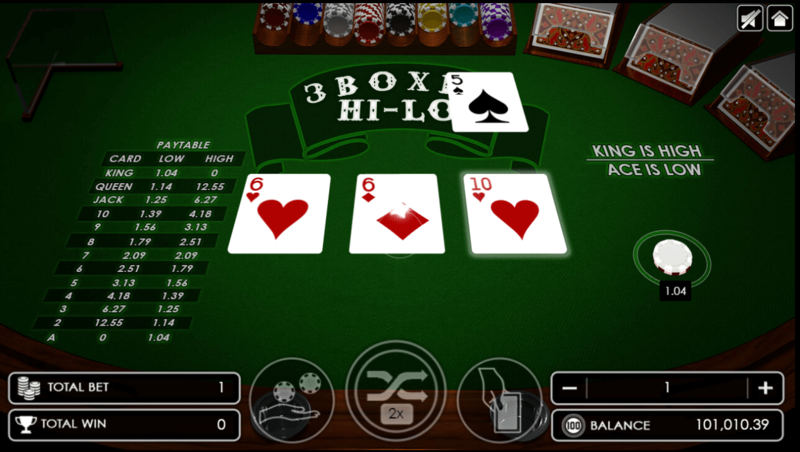 After winning, player has an option to re-shuffle the three cards dealt to another three cards. The winnings will not be affected even after the shuffle. The maximum amount of shuffle is only two times, so the player should choose the re-shuffle option wisely. Shuffle chance amount will increase after player has guessed 3 consecutive WINS. L. “Higher” Betting Options – are active once the current card value is higher than Ace. The payout value will also be displayed. M. “Lower” Betting Options – are active once the current card value is lower than King. The payout value will also be displayed. N. Total Bet Information – displays the total bet amount of the table. O. Total Win Information – displays the total win amount of the round. Q. Shuffle Button – shuffle the cards on the table, shuffle button will only be activated when the player has a chance to do it. Shuffle card chance amount will be increased if the player guesses the next card value three times consecutively. The maximum amount of the shuffle card chance is only two. R. Deal Button – starts the round with the bets the player chooses. S. Bet Selection – clicking + will increase the bet amount and clicking – will decrease the bet amount. V. Home Button – to close the game and to go back in the Games Menu. In the case where a player encounters network connection issue or any other issue that halt the gameplay after "DEAL" button has been clicked and no winning amount to be collected, system will wait for 24 hours for player to resume the game otherwise the player will be considered forfeiting the game and losing the bet. What is Three Boxes Hi-Lo?